By now, if you’ve read my posts, you may know that I have a serious pizza problem. In my house, the ‘P’ word, means pizza. If my husband says the ‘P’ word late on a Friday night, I have a hard time saying no. In fact, I normally don’t. 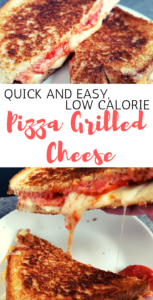 These pizza grilled cheese are my low calorie solution to curbing my pizza cravings, any time of day. For a very long time, I was obsessed with Hawaiian pizza. I know, I know, pineapples on pizza can get people going, but I loved it. With double cheese, Hawaiian pizza is jam packed with calories and wasn’t helping me at all. Really, all I want is melted cheese. 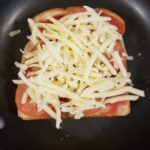 This pizza grilled cheese has the perfect amount of melted cheese, sauce and pepperoni for a fraction of what a pizza will set you back. 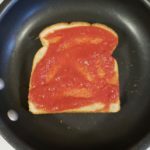 With whole wheat bread and crushed tomatoes for sauce, it also boasts more nutrients and health benefits. I have spoken before about using crushed tomatoes in place of spaghetti sauce or pizza sauce. I do this because of my brief stint with Weight Watchers. When I was on Weight Watchers, fruits and vegetables were free (worth 0 points). When I called and asked if crushed tomatoes were the value of the can or considered a free tomato, they told me crushed tomatoes were 0 points. Ever since then, I use crushed tomatoes in every scenario I can. They are cost effective and free of the added sugar you can find in many pasta sauces. Check out my favourite no salt added crushed tomatoes here. What do you crave and how do you handle it? Let me know in the comments below! 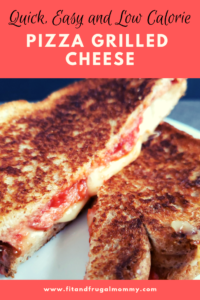 A low calorie lunch recipe to help fight those pizza cravings! Using 1 tsp of butter, butter one side of a slice of bread. Place it face down in the pan. Spread the 1.5 tbsp of crushed tomatoes over the bread. 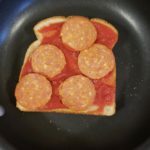 Place the pepperonis on the sauce. Add the 1/3 cup of shredded mozzarella. Butter the second piece of bread with the remaining butter. Place it on top of the cheese, butter side facing up. Press down on the sandwich together with a flipper to compress. Cook on medium heat. Once the bottom bread begins to brown, flip to brown the other side. 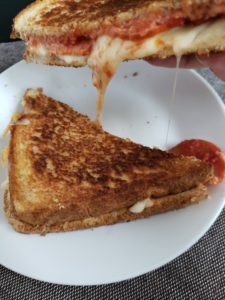 Flipping can be tricky with the cheese on top, I use another utensil (like a butter knife) to hold the sandwich together and help me flip the sandwich easily. 2 WW Freestyle points can be eliminated if you use butter spray or cooking spray in place of the light butter.